Save money by getting Wall Standards. Heavy Duty Wall Standards are a great alternative from other Wall System because it is easy to setup and fit to your specifications. Heavy Duty Wall Standards stick out from the wall of about 5/8” and has only three colors to pick of Black, Chrome, or Brushed Zinc. Each Heavy Duty Wall Standards have 1” slots and are 2” apart from each other, measuring from the center of the slot. The T-Concealed Standards furthermore hides the 5/8” BUT requires to be installed within the wall BEFORE the walls are constructed. 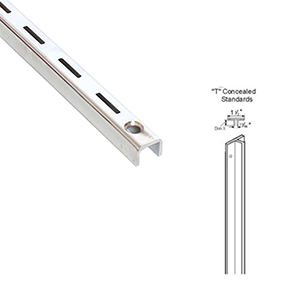 Not everyone will and can use the T-Concealed Standards but those that do will love that can adjustable height of their shelves and faceouts with ease. Get Accessories for your 1” Slot Heavy Duty Wall Standards to upgrade and improve the functionality of your walls from American Retail Supply. Call if you have questions or need to order over the phone, 1-800-426-5708.